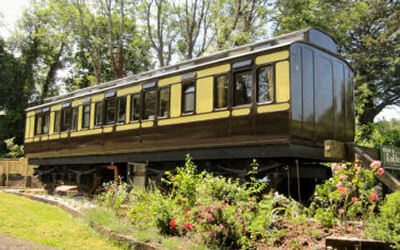 ﻿ Choose Your Perfect Holiday Carriage | Beautifully Restored & Converted. Connected to mains services - water, drainage, gas, etc. Step back in time with our 1950's coach Harvey in Hayle - a nostalgia trip on a Harry Potter style corridor carriage that exudes the charms of a golden age of travel. At 65 feet long there is enough space for all the family, but with the flexibility for couples or smaller groups to rent only one end at a reduced price. The garden is large and fully enclosed with swings, signal box play house/bird hide, butterfly garden and nature area. 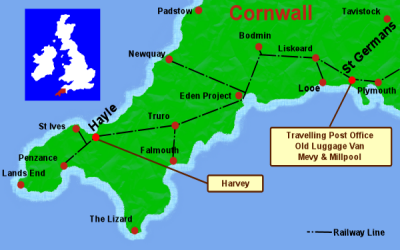 Situated within the Cornish Mining World Heritage Site and with North Coast surf and surf schools on the doorstep, Harvey is only a twenty minute walk from the three miles of golden sands that is St Ives Bay. St Germans is a great place to escape the crowds. Only a few miles from the fishing villages of Looe and Polperro, and the beautiful beaches and rugged cliffs of Whitsand Bay, this unspoilt gem of a location is perfect for singles, couples and smaller family groups. For children there is a play area on site, and an excellent village play park. The carriages are only a few minutes walk from Port Eliot Estate recently used for the filming of a Rosamunde Pilcher novel, with its annual festival and beautiful spring gardens. 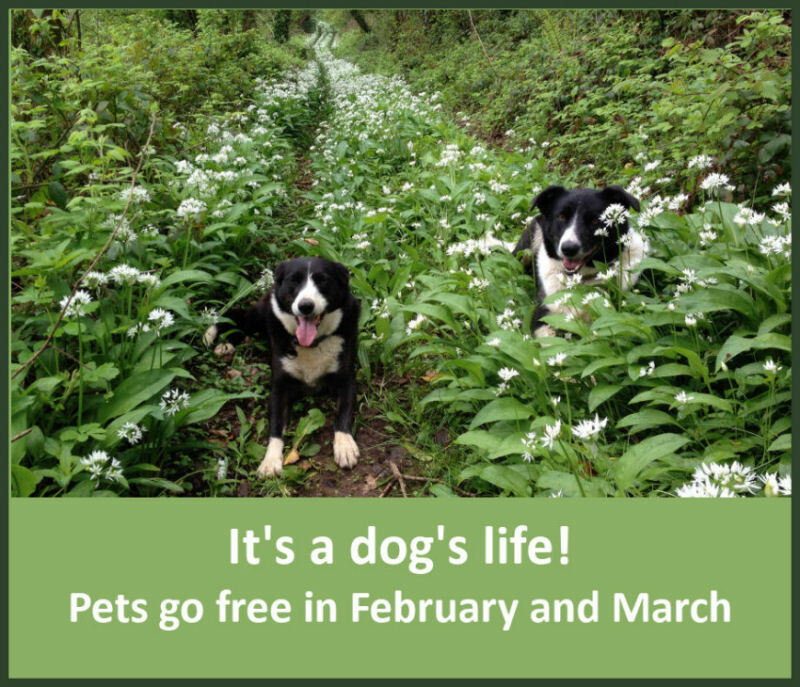 Guests staying at St Germans have access to our ten acres of private woodland, with winter snowdrop walk, nature trail, bluebells, garlic and summer flowers and sweet chestnuts in autumn. 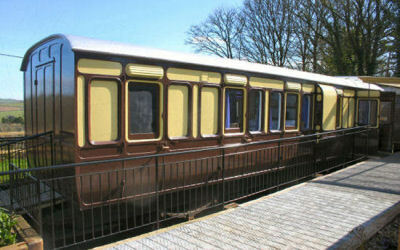 All carriages at St Germans have use of the following shared facilities: childrens push-a-long toy play area, games room with air hockey table, information centre, washing m/c and dryer, freezer, swing ball, etc. We are very proud of Mevy, a GWR Slip Coach, with its first class sleeping compartment and bespoke triple bunk beds for children. Converted and equipped to the highest standards in an eco friendly way, Mevy has fabulous views over the surrounding countryside and unlike the Travelling Post Office and The Old Luggage Van, is set away from the railway line. Mevy is sumptuously upholstered and equipped with allergy free mattresses and bedding. Sorry no pets in this carriage. 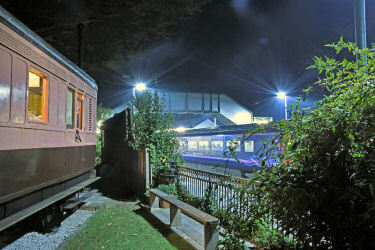 Nestled in a sweet trackside garden beside the station at St Germans, The Old Luggage Van is suitable for single guests or couples. With a double bed and wood burning stove it makes a great, cosy place to retreat to in the winter and has a lovely enclosed spring garden filled with bulbs and camellias. 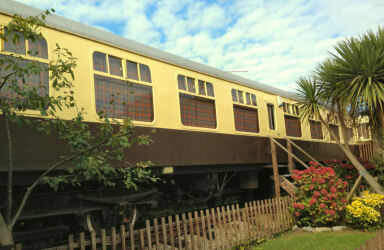 We offer short breaks all year round in the Old Luggage Van and these are very popular. The garden is enclosed and pets are welcome. 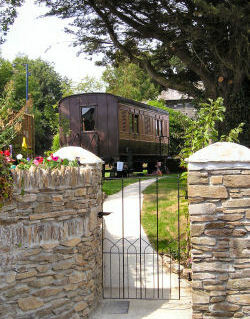 The Travelling Post Office, also beside the station in St Germans has been our most popular coach to date. Beautifully converted for families of four (or up to six using the sofa bed in the lounge) it is open for short breaks and weeks all year. 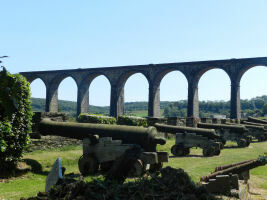 It featured in Michael Portillo's Great British Railway Journeys on BBC2 and also on ITV1's Holiday Home Sweet Home, a collection of the best UK holiday breaks. Like Harvey it books very early in school holiday times, so do secure your break well in advance to avoid disappointment. The two bedrooms are adjoining with a connecting door and there is space in the double for a cot. Millpool is our latest carriage and has been designed to be accessible to both able bodied and those with mobility problems. 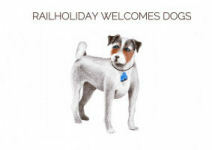 It is equipped to the Visit England M3I National Accessibility Scheme standard. The view from Millpool over the river valley and the fields of Port Eliot Estate is stunning and although we are still in our first year we already have several repeat bookings - for this year! In addition to Millpool, for those with limited mobility the Travelling Post Office has a permanent ramp giving wheelchair access to the lobby. We have a mobility scooter and a smoke alarm for the deaf available on request. Guide dogs are free. Autistic children and adults are very welcome. Please let us know of any special needs you have, and we will be able to advise on suitability. Please follow this link to see our access guide. 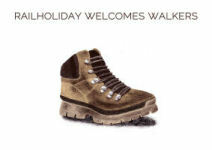 All carriages are suited for walking and outdoor activities. Sited beside Cornish stations, public transport access is excellent - for rail enthusiasts there are always plenty of trains to enjoy, but not so many you won't enjoy a full nights sleep. 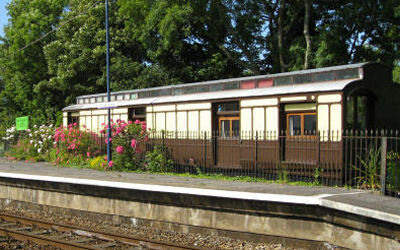 Trainspotting is best in the line-side coaches at St Germans, The Old Luggage Van and The Travelling Post Office . There is a viewing deck at Harvey so children can wave at the trains and see who can get the most flamboyant hoot!